While examining why we haven’t made more progress eliminating Noise Induced Hearing Loss (NIHL) I look to our neighbours, the United States, because their development path is well defined. As early as the beginning of the last century, noise was recognized as being an industrial hazard. Because it was difficult to measure noise at the time, NIHL was recognized but not quantified nor were any limits on exposure set. After a series of studies by the military and military sponsorship of civilian laboratories after World War II through the mid-1960s, 90 dBA was determined to definitely be a level above which actions to limit exposures were necessary. Therefore, 90 dBA was written into the U.S. Occupational Noise Standard in 1969 as part of the legislation as the Permissible Exposure Limit (PEL). The Occupational Safety and Health Administration (OSHA) was directed to develop the rest of the regulation picking up from paragraph (c) of the legislation to define the steps necessary to form an effective hearing conservation program. It is recognized that about one quarter of workers whose LEX,8h is above 90 dBA will develop NIHL. Albeit the National Institute for Occupational Safety and Health (NIOSH) revised its own Recommended Exposure Limit (REL) down from 90 dBA to 85 dBA and further recommended a 3-dB exchange rate instead of the earlier 5-dB exchange rate in the legislation, today the 90 dBA PEL (Permissible Exposure Limit) remains in the U.S. OSHA regulation. OSHA set an action level of 85 dBA that includes exposed workers in a hearing conservation program and the use of hearing protection devices (HPDs) for those workers who had shown a change in hearing that could be attributed to noise exposure. There is more to the history of NIHL regulation in North America. In 1979 the U.S. EPA issued a regulation that required HPD attenuation value be placed on the packaging of all HPDs sold in the United States (this means the same information appears in Canada as the product sold in Canada is mainly the US product). This “required HPD attenuation” is the Noise Reduction Rating (NRR) that was to be used by Audiologists and Industrial Hygienists to determine if the HPD’s noise reduction would be adequate to reduce protected exposure levels to below the PEL. The problem was that, although Audiologists and industrial hygienists now had this new NRR for selecting HPDs matched to noise exposures, workers still continued to lose their hearing. Study after study comparing NRRs to attenuation actually achieved by those wearing the protection yielded considerable discrepancies. Finally, in 1994, a study published by Berger (Aearo, now 3M), Franks (NIOSH ret), and Lindgren (GN Netcom) compiled the data from 22 previous studies from the prior 20 years and conclusively showed that there was hardly any relation between the NRR and the protection workers actually received.1 Further, studies of the HPD-using noise-exposed workers found that they continued to get NIHL. The OSHA directed programs were merely documenting the development of NIHL, not preventing it. One union official referred to this asaudiometric voyeurism. There was a wide discrepancy between what laboratories determined for the NRR as the attenuation potential of a hearing protector and what users were achieving in practice. Why? Set aside, the consideration of whether the PEL/exchange-rate should be 90 dBA/5 dB or 85 dBA/3 dB. For years the most prevalent thinking concerning the ineffectiveness of HPDs has been the problem of matching earplugs and earmuffs with a particular wearer’s ears. Once the best match HPDs had been selected, a wearer needed to be taught how to fit them properly. The Industry began Fit Testing with the development of Fit Check in 1995.2 Three decades of pursuing this course has had relatively little effect on the problem. In fact, Dr. Peter Rabinowitz, an associate professor in the Department of Environment and Occupational Health at the University of Washington, has studied one of the leading users of Fit Testing systems, Alcoa, for years. Dr. Rabinowitz saw no change in outcomes of Alcoa’s hearing conservation program as a result of Fit Testing. Maybe fitting the protector is not entire problem. Unpublished research conducted by a branch of the U.S. Military has shown an inability to trigger preliminary hearing loss with even a minuscule amount of hearing protection. What does that mean? It might mean the weight we have been placing on matching attenuation to noise exposure is less important than we thought in preventing NIHL. Is it possible we’ve been asking ourselves the wrong question? Instead of asking ourselves, “How do we get people to wear their hearing protection?” we should be asking,“Why aren’t people using their hearing protection to greatest effect?” Sadly, a panel of experts at the recent National Hearing Conservation Association (NHCA) conference observed that they were not aware of any research into the topic of the causes of NIHL either ongoing or planned. It acts to warn us of danger before any other sense because it works around corners in 360 degrees. Is it possible that what prevents us from using Hearing Protection Devices (HPDs) correctly is the protection itself? Unlike any other PPE, HPDs typically work by partially disabling the sense it seeks to protect. By disconnecting us from our surroundings, reducing or eliminating the effectiveness of our hearing in a noisy, dangerous, environment, we create a situation the human may be “hard wired” to perceive as unsafe. The deck of an aircraft carrier during flight operations is one of the noisiest places on earth. Sound levels can reach 150 dB. Flight crews exposed to those levels are mandated to wear earplugs, inside an earmuff, inside a helmet (the helmet is not impact protection. It reduces “bone conduction”; the tendency of the bones of the skull to conduct sound to the ears). It is well known that workers in high noise are easier to protect than workers in moderate noise; they seem to take noise more seriously. But, given this dangerously noisy environment, why do airmen sometimes leave out their earplugs. 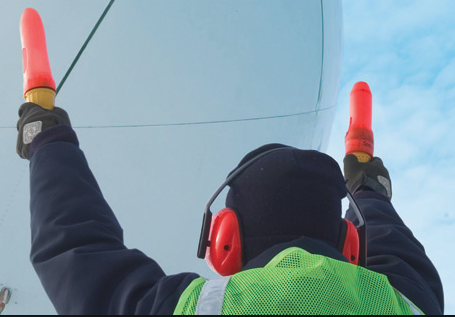 Anecdotally, the expression used by flight crews to explain their actions “deaf is better than dead” implies that sense of life-threatening danger outweighs the sense to protect one’s hearing. Could this be a more prevalent than we have heretofore imagined? Is it possible we have undervalued our need to hear when safety is at issue? Let’s presume, for a moment, that we have. What would hearing protection that allowed us to hear safety be? We know that most industrial noise is in certain frequency ranges. If these are not the same frequencies humans’ use for speech, then we should be able to create hearing protection that passes “speech frequencies” and blocks noise. In this way we could control the loudness with which our ear perceives our environment and set a separate level for interpersonal communication. As well, we could facilitate other forms of communication through use of radios, like 2-way or cell phones, while still keeping industrial noise at a safe level. Would this make a difference as to how users wore their hearing protection? We can improve hearing loss prevention program outcomes. It requires the commitment of the organization to change behaviour. It starts with removing as much of the noise as possible and protecting against the rest. It requires facilitating functional hearing protection options. And it requires persistence and perseverance but it can be done. I know. I’ve seen it work. Berger EH, Franks JR, and Lindgren FL. International review of field studies of hearing protector attenuation. Presented at the 5th International Conference on the Effects of Noise on Hearing, Gothenburg, Sweden, May 1994. Developed by Dr. Kevin Michael of Michael and Associates www.michaelassociates.com. Zohar D. Modifying supervisory practices to improve subunit safety: A leadership-based intervention model. J Appl Psychol 2002;87(1)156–63.